The aim of this book is two-fold: to introduce the fundamental concepts of linear algebra and to apply the theorems in computation-oriented applications. 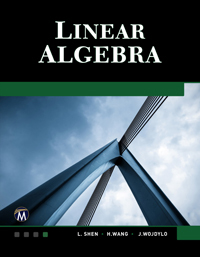 The book is suitable for a one semester course in linear algebra that can be used in a variety of contexts. The presentation of the material combines definitions and proofs with an emphasis on computational applications, providing examples that illustrate the use of software packages such as Mathematica®, Maple®, and Sage. 1: Vector Spaces. 2: Linear Transformations. 3: Linear Operators. 4: Orthogonal Bases. 5: Matrix Decomposition. Index. L. Shen, PhD, H. Wang, PhD, and J. Wojdylo, PhD are university professors who have numerous years of teaching experience.